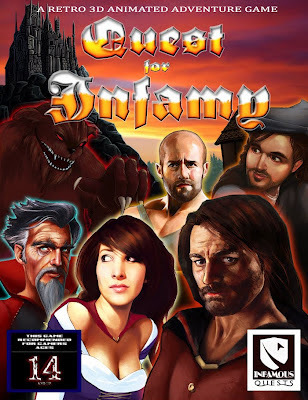 Quest for Infamy is the first original game by Infamous Quests, the creators of the King's Quest III and Space Quest II fan remakes. It is a hybrid point and click adventure game and RPG where you take the role of a man who is trying to start his life over after running away from a shady past. It was funded by a successful crowd funding campaign on Kickstarter, and was released for PC, Mac, and Linux on July 10, 2014.